North Shore Schools, Glen Head - Bundled with black garbage bags filled with toys, the North Shore Key Club and North Shore Chamber Orchestra made an exciting visit to Cohen Children’s Hospital prior to winter break for North Shore’s 27thAnnual Toy Drive. The visit is a tradition at the North Shore Schools which is made possible by Dr. Rob Gerver and Mrs. Lisa Polito. In 1988, Dr. Gerver started this toy drive. 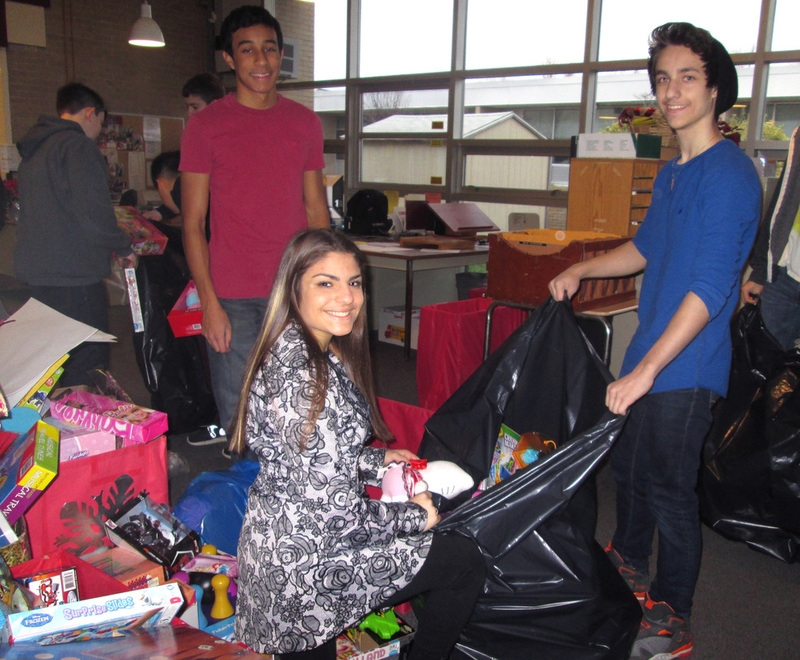 The program, once exclusively run by the high school, has become a district wide event over the years, broadening the spirit of giving across all of the schools. Dr. Gerver, who lives right by the hospital, would jog past it each day. Wanting to raise the spirits of the children inside, he came up with the idea. This year, not only was the gift turnout wonderful, but the North Shore Schools Chamber Orchestra performed many holiday hits which were loved by all in attendance. Over the years, the toy drive has grown dramatically; now everyone from every school is able to contribute to this event. Boxes were placed in all five of the school buildings, and students and their families were encouraged to drop off toys, books, CDs, games, and stuffed animals. In addition, the North Shore Key Club assisted by donating care bears, coordinated the packaging of the toys, and delivering the gifts to Cohen Children’s Hospital. North Shore Kiwanis Club also assisted with the toy donations. Pictured are members of the North Shore Key Club and Chamber Orchestra participating in the 27th Annual Toy Drive at Cohen Children’s Hospital under the direction of Dr. Rob Gerver and Mrs. Lisa Polito.